White, SOS Paper Bags, 4-1/4" x 2-3/8" x 8-3/16"
Dimensions: 4-1/4" x 2-3/8" x 8-3/16"
Natural Kraft, SOS Paper Bags, 4-1/4" x 2-3/8" x 8-3/16"
Natural Kraft, SOS Paper Bags, 5" x 3-1/8" x 9-5/8"
Dimensions: 5" x 3-1/8" x 9-5/8"
Natural Kraft, SOS Paper Bags, 6-1/4" x 3-13/16" x 12-1/2"
Dimensions: 6-1/4" x 3-13/16" x 12-1/2"
Natural Kraft, SOS Paper Bags, 6" x 3-5/8" x 11-1/16"
Dimensions: 6" x 3-5/8" x 11-1/16"
White, SOS Paper Bags, 6" x 3-5/8" x 11-1/16"
White, SOS Paper Bags, 5" x 3-1/8" x 9-5/8"
Natural Kraft, SOS Paper Bags, 7-1/8" x 4-3/8" x 13-15/16"
Dimensions: 7-1/8" x 4-3/8" x 13-15/16"
White, SOS Paper Bags, 6-1/4" x 3-13/16" x 12-1/2"
White, SOS Paper Bags, 7-1/8" x 4-3/8" x 13-15/16"
Natural Kraft, SOS Paper Bags, 7-11/16" x 4-3/8" x 16-1/16"
Dimensions: 7-11/16" x 4-3/8" x 16-1/16"
White, SOS Paper Bags, 7-11/16" x 4-3/8" x 16-1/16"
Our Paper Lunch Bags are Square Opening Sacks (SOS) making them perfect for quick packaging! These lightweight and stand-alone bags feature a serrated top and are gusseted to provide optimal space and easy packaging for an array of items.These Paper Lunch Bags are perfect for baked goods, lunches, jewelry and more! Each Paper Lunch Bag is 100% recyclable, making them ideal for Eco-conscious businesses including coffee shops, gift stores and even individual use.We offer Paper Lunch Bags in 2 different colors, Kraft and White, and in 5+ sizes! 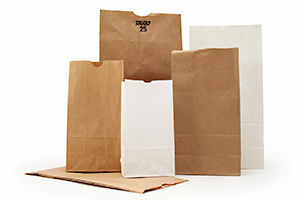 Our Paper Lunch Bags can be ordered by the case, with each case containing 500 paper bags. For customizing options on our Paper Lunch Bags, or to speak to a Product Expert,please contact American Retail Supply at 1-800-426-5708.